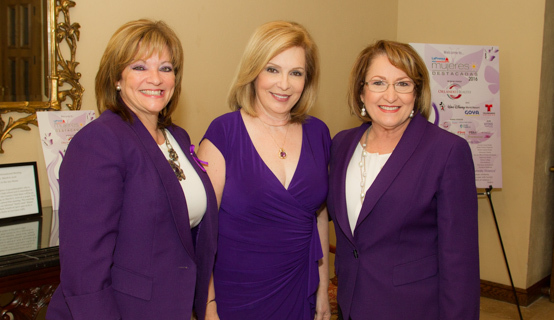 Orange County Mayor Teresa Jacobs joined community leaders at La Prensa’s ninth annual Mujeres Destacadas (Women Who Make a Difference) Awards Ceremony honoring exemplary women and their achievements. La Prensa, the oldest Hispanic newspaper in Central Florida, launched the Mujeres Destacadas awards in 2007 as a way to recognize extraordinary Hispanic women who make a difference in the lives of many people in our community. Three award finalists were selected in five achievement categories. The winners, who were announced at the event, included Olga González for community leadership, Daisy López-Cid for business and technology, Rosa Cintrón for education, Adamar González-Figueroa for health and Melissa Lanzo for arts and culture. “As we hear about the special work these ladies that we are honoring do, we hope that their work will inspire you to stand up for what is right,” said Dora Casanova Nelson, publisher and CEO of La Prensa. Orange County continues to support its Hispanic community with the Hispanic Heritage Committee of Greater Orange County (HHCGOC). The committee was founded in 1999 with the purpose of providing opportunities that promote and highlight the contributions made by individuals of Hispanic descent in the community. HHCGOC is a volunteer-based organization that coordinates several events commemorating Hispanic Heritage Month including the annual kick-off celebration and Orange Fiesta in the Park. Photos from the awards luncheon can be found on Mayor Jacobs’ Flickr page.